An inviting small violet slipper tub is the focal point for an attic alcove bath. 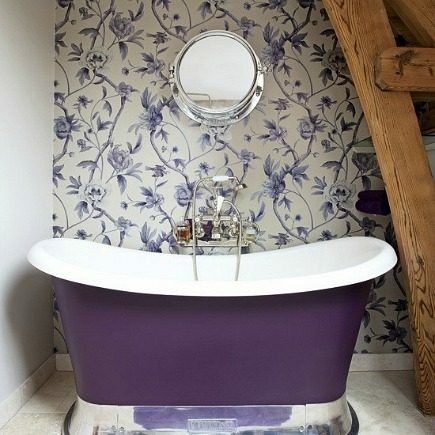 A small but attractive violet slipper tub is a freestanding soaker tucked into the corner of an attic space. The sloped sides of this bathtub style make it the perfect place to relax. There are no fancy whirlpool gizmos in the tub which means no noise interrupts a peaceful time out. What’s perhaps most interesting, in addition to the striking color, is that the Chariot bath has the look and feel of cast iron but without the weight. Developed by Chadder & Co., specialists in English roll top bathtubs, this “chariot” style gives a new meaning to the old phrase “slip into something more comfortable.” The base of the tub is a polished nickel finish that flares to keep it sturdy. The nickel finish is repeated on the wall mounted faucet and hand-cast porthole cabinet mirror. What a the perfect place to get away from the hustle and bustle and recreate a spa experience at home. Don’t miss another relaxing space in the Red White and Blue Bath, and more Shades of Purple in the Lavender Fantasy Bath. I am redoing a bath in slo-mo — and I am in the market for a slipper tub. (not purple, although this is very cool) Is this a trade only resource? Thanks for visiting today — I enjoyed catching up with you. I love the book storage ideas. It is not a trade-only source and they ship worldwide. Also, currently having a sale: http://www.chadder.com/index.php Let me know if/what you order, and if so, I’d love to see an after picture! Just wanted to let you know that you can find all our bathroom plumbing lines on our website. We carry a full line a bathroom fixtures to fit all your needs. You can also email us at chadderusa@gmail.com for any questions. Your bathroom fixtures are wonderful. Thanks for commenting. Slipper tubs are lovely and there are so many of them around. They make gorgeous baths as long as one is agile. Allison will know more about the source.